Top row: Frank Every, R. Hawkins, J. Kean. Third row: D. Astley, J.B. Beecroft, Albert Jackson, W. Thompson, M. McQuay, George Hamers, G. McBride, Vernon K. Rowe, C. Heiger, W. McBride, Mr. Shortt. Second row: G. Lick, L. Cain, C. Smith, Mrs. A. Sturgess, V. Richardson, Mrs. D. Holliday, G. Kemp, W. Heard, A. Richardson, Mrs. H. W. Quantrill, M. Smith. Bottom Row: E. McBride, B. Heard, V. Bently, Mrs. G.P. Lym, Mrs. V.K. Rowe (organist and leader), E. Thorndyke, A. Copeland, L. Barker, Rev. Russell O'Brien. 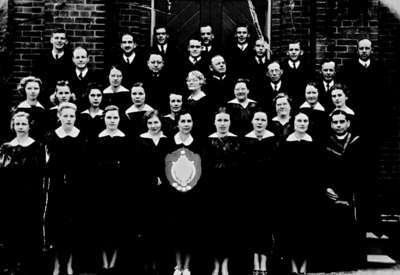 Whitby United Church Choir, June 1939, Marjorie Ruddy. Whitby Archives 09-004-019.